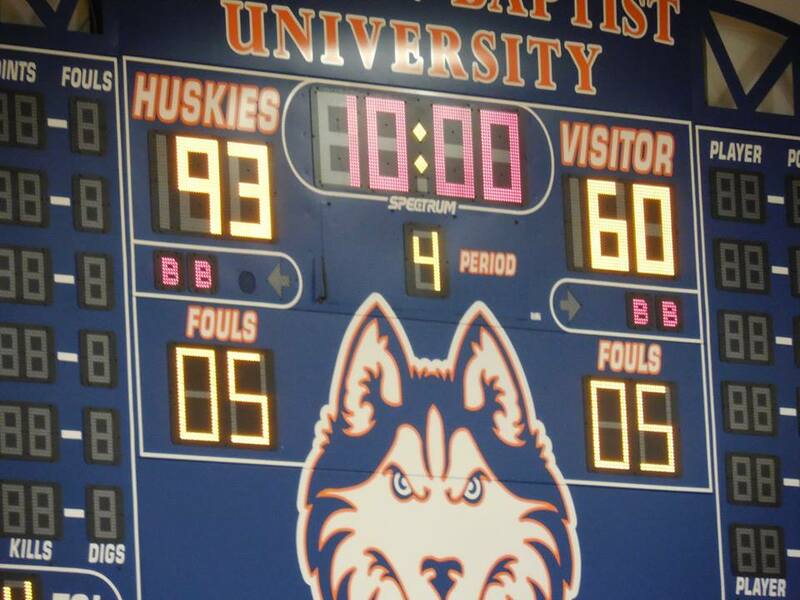 HOUSTON, TEXAS (November 21, 2018) With four players scoring in double-figures, including a double-double, the HBU Huskies dominated Howard Payne by the score of 93-60 at Sharp Gymnasium on the campus of Houston Baptist University. In pushing their season record to 3-1, head coach Donna Finnie saw her Huskies pull down a season high 58 rebounds and score a season high 93 points. Amanda Johnson (Georgetown HS, Georgetown, Texas) came of the bench to tally a season high 23 points, while Megan Valdez-Crader (Crosby HS, Crosby, Texas) scored 12 in her fourth consecutive game in double figures. Taylor Kollmorgan (Second Baptist HS, Houston, Texas) added 12 in the effort. That, along with her 12 rebounds, gave the senior her third double-double of the season. Sophie Taylor (Westwood HS, Austin, Texas) contributed 16 points to the Husky total. Howard Payne, who fell to 1-3 in the season, was led by Chelsey Harris (Midway HS, Waco, Texas) who scored a season-high 30 points. The Huskies will head to Lubbock, Texas on Saturday, November 24 to take on 3-1 Texas Tech. The Red Raiders are averaging 78 points and 50.8 rebounds per game. Tip off is set for 2 p.m. CST. BEAUMONT, TEXAS (November 21, 2018) When the Lamar Cardinals (7-4, 6-3 Southland Conference) takes the field on Saturday in Cedar Falls, Iowa against the Northern Iowa Panthers (6-5, 5-3 Missouri Valley Football Conference), it will not be the first time the two schools have faced off. 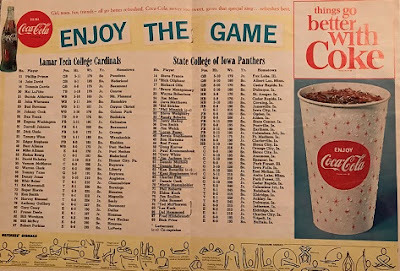 On December 12, 1964, Lamar Tech, (as Lamar University was known at the time) played State College of Iowa (former name of Northern Iowa University) at Shotwell Stadium in Abilene, Texas in the Pecan Bowl. The game was contested as the NCAA Midwest Football Championship, and ended with the Panthers edging out the Cardinals, 19-17. Mike Allman scored first for Lamar with a 26-yard field goal in the first quarter. He also added two extra points after each of the Cardinals' two touchdowns/ The first of the two touchdowns came in the third quarter on a 80-yard pass reception from Phillip Primm to Frazier Dealy. The second touchdown came in the fourth quarter when Primm connected with Gary Casey on a seven-yard pass. Prim was 8-of-16 for 171 yards in the air, with one interception. Dealy caught four passes for 114 yards while Casey only reception was for the score. Saturday's game will be televised on ESPN3 with a scheduled kickoff time of 4 p.m. CST. HOUSTON, TEXAS (November 20, 2018) Trailing by 14 points in the third quarter, the Rice Owls outscored the Texas Southern Tigers 25-8 in the final seven and one-half minutes to take a 76-71 win in front of 529 fans at Tudor Fieldhouse on Tuesday evening. TSU jumped out tp a 63-49 lead with 7:49 remaining in the game, but the Owls recovered from their third quarter slump and battled back to take their second win of the season The 2-2 Owls, whose two losses came against ranked teams, will look for their third win of the season on Friday afternoon (November 23) when they host Georgia State with a 2 p.m. tip off. 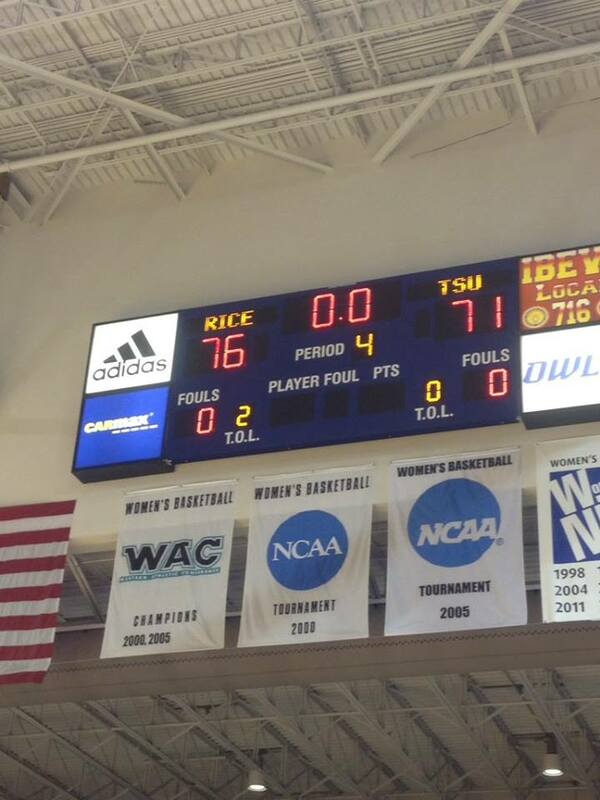 Erica Ogwumike (Cypress Woods HS, Cypress, Texas) led Rice with 20 points, followed by Jasmine Smith (The Kinkaid School, Cypress, Texas) and Lauren Grigsby (Dekaney HS, Spring, Texas), each with 16. Ogwumike was 11-of-12 from the freethrow line, with Smith shooting 7-of-8. Grisby was 4-of-5 from three-point range. Those stats contributed to 30 of Rice's 76 points. The Owls tallied 11 from behind the arc, to add to theor score. The Tigers had three players in double figures; Marquia Turner (Hoover HS, Canton, Ohio) with 21 points, followed by Brenae Andrews (Grosse Pointe South HS, Detroit, Michigan) with 16, and Olivia Cunningham (Horn Lake HS, Horn Lake, Mississippi) with 15. Next up for the 1-2 Tigers is a Friday, November 23 game against McNeese State in El Paso. LAKE CHARLES, LOUISIANA (November 20, 2018) It is being reported by KPLC TV in Lake Charles that McNeese State University has decided not to renew the contract of head football coach Lance Guidry (shown right). The announcement was made by Bruce Hemphill, who is the Director of Athletics at McNeese. 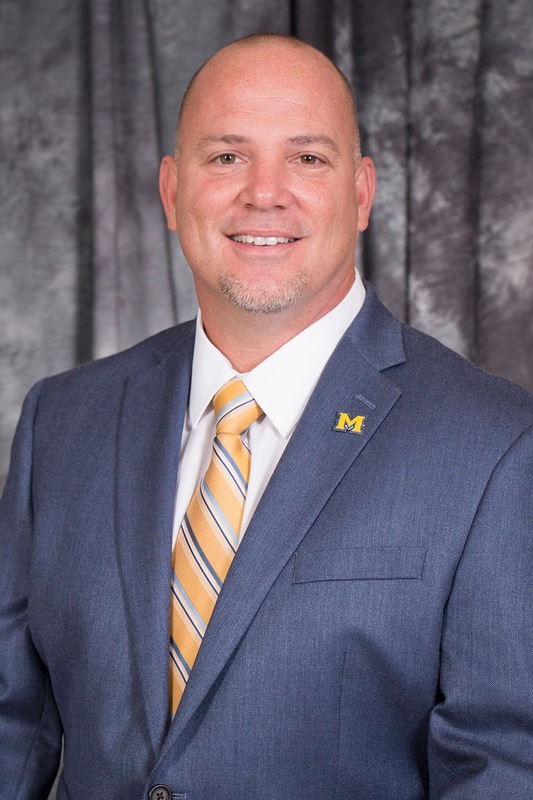 Guidry has been with the athletic department as a coach since 2013 when he was hired as the defensive coordinator and assistant head coach; a role he held until 2015. He was elevated to head coach in 2016, and previously was employed by McNeese from 2000 to 2004 as defensive coordinator. He returned to campus in 2008 as the defensive backs coach. The 47-year-old Guidry was a four-year letterman for McNeese from 1990 to 1993. He was an all-conference defensive back for the Cowboys and part of two conference championship teams (1991, 1993). In his three-plus years as head coach, he posted a 22-13 record, including a 6-5 record this season. In conference play, the Cowboys were 5-4 in 2018, with the four losses coming in the final five gam3s of the season. Hemphill also announced a national search for Guildy's replacement will begin immediately. Toyota Stadium in Frisco, Texas. Three Southland Conference schools have qualified or been selected for the 2018 NCAA Football Championship Subdivision tournament with all three football teams beginning play on Saturday, November 24, 2018. Nicholls State (8-3), who won the conference championship with a 7-2 record, received the automatic bid and will host San Diego at John L. Guidry Stadium in Thibodeau, Louisiana with a 3 p.m. CST kickoff. The Toreros won the 2018 Pioneer Football League with a 8-0 record (9-2 season). The winner will face No.3 seed Eastern Washington (9-2) on December 1 in Cheney, Washington. The winner will face No.3 seed Eastern Washington (9-2) on December 1 in Cheney, Washington. Incarnate Word (6-4) will take on Montana State (7-4) on Saturday at Bobcat Stadium in Bozeman, Montana. The Bobcats finished in fourth place in the Big Sky Conference with a 5-3 record. Kickoff is schedules for 2 p.m. CST. The winner will take on No. 1 North Dakota State (11-0) the following Saturday. The Bison won the Missouri Valley Football Conference and are the 2018 NCAA FCS National Champions. The Lamar Cardinals (7-4) will round out the SLC playoff teams with a Saturday match up against the Northern Iowa Panthers (6-5), who finished third in the Missouri Valley Conference. The game will be played at the UNI-Dome in Cedar Falls, Iowa with a 4 p.m. CST start. The winner will take on No. 6 UC Davis on December 1 in Davis, California. All first and second round games can be viewed on ESPN3. HOUSTON, TEXAS (November 17, 2018) Texas Southern could not overcome the fleet foot of kicker Jamie Gillan (Leonardtown HS, Leonardtown, Maryland) as he booted five field goals to lead the Arkansas-Pine Bluffs Golden Lions to a 15-10 win over the Tigers at BBVA Compass Stadium. The 2,045 fans in attendance, with the vast majority supporting the Tigers, witnessed Gillan kick field goals of 24, 37, 29, 46, and 37 yards and dash their hopes of TSU winning their second conference game of the season. TSU downed Mississippi Valley State by the score of 42-14 for the only conference win on October 27. The Tigers and Golden Lions traded scores in the first quarter, with TSU getting on the scoreboard first on a 24-yard kick by Aaron Cuevas (North Shore HS, Houston, Texas). That was followed by the first of Gillan's scores, a 37-yarder. He added the 39-yard field goal in the second quarter before Glen Cuiellette (Manderville HS, Manderville,Louisiana) romped 21 yards for the only touchdown of the game. Cuevas added the kicking conversion to give the Tigers a 10-6 lead at the half. Gill10 an's 46-yard and 27-yard field goals came in the third quarter, with the 22 yard field goal coming with 1:48 left in the game. Texas Southern will conclude the season with a Saturday, November 24 match up against long-time rival Prairie View A&M. Game time is set for 1 p.m. at New Panther Stadium in Prairie View, Texas. HOUSTON, TEXAS (November 17, 2018) After jumping out to a 28-10 lead after 30 minutes of play, the Sam Houston State Bearkats went on to down the HBU Huskies by the score of 42-20 at Husky Field in Houston. The contest, which was the final game of the season for both teams, saw the Bearkats complete the 2018 season with a 6-5 record; 5-4 in Southland Conference action, while HBU posted a 1-10 record, with a 0-9 record in conference. The game was much tighter than the score indicated. Both squads recorded over 400 yards of total offense (SHSU: 401 yards and HBU: 490 yards). One key factor was in the HBU loss third-down conversions, along with fumbles. The Huskies fumbled the ball three times; losing possession to the Bearkats on two of them. In third-down conversions, HBU could manage only four on 18 attempts (22%) while the Beatkats conferred on half their attempts (8-of-16, 50%). Sophomore quarterback Bailey Zappe (Victoria East HS, Victoria, Texas), who completed the final game of his historic sophomore season, was 17-of-34 in the air for 219 yards. He also carried the ball 11 times for 25 net yards, with the longest run being 15 yards. Sophomore LaDarius Dickins (Rowlett HS, Rowlett, Texas) carried the ball 15 times for 121 yards, while sophomore teammate Dreshawn Minnieweather had 16 carries for 105 yards and one touchdown. Kicker David Dominguez (Mortan Ranch HS, Katy, Texas) booted two field goals of 44 and 33 yards, along with a two extra points. The final touchdown of the game was a one-yard run by sophomore wide receiver Gamar Girdy Brito (Victoria West HS, Victoria, Texas). HOUSTON, TEXAS (November 17, 2018) Under clear skies and a brisk 71 degress, hard-core and passionate soccer fans filled Houston's BBVA Compass Stadium on Saturday afternoon to witness two historic and storied Mexican programs battle each other in an international exhibition game. 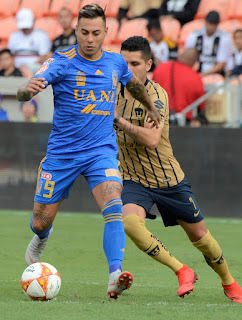 The friendy match saw Tigres UANL score one goal in each of the two halves to down UNAM Pumas by the score of 2-0. The first half saw forward Eduardo Vargas (shown below, #9 in blue) take a pass from fellow forward Andre Gignac (shown above, #10 in blue) and slip it past goalkeeper Miguel Fraga in the 21st minute for the first goal of the game. They added their second goal 46 minutes later, in the 67th minute, when Gignac got in on the receiving end of a pass for the Tigres' second goal. Midfielder Raul Torres send the ball to Gignac, who again drilled it past Fraga for the score. Tigres took eight shots in the match, with two of them on goal, while Pumas had seven shots, with two also on goal. Nine yellow flags were issued; five to Pumas and four to Tigres; for various and assorted infractions. As soon as the game was completed, the grounds crew quicky coverted the soccer pitch to a football field, for the second game of the double header at BBVA Compass Stadium. The Texas Southern Tigers had a 7:30 p.m. CST match up against SWAC rival Arkansas-Pine Bluff. The next international friendly soccer match at BBVA Compass Stadium is set for Saturday, December 29 where Club America will face Santos Laguna with a scheduled 4:30 p.m. start. HBU to face Fordham in first home game of season. 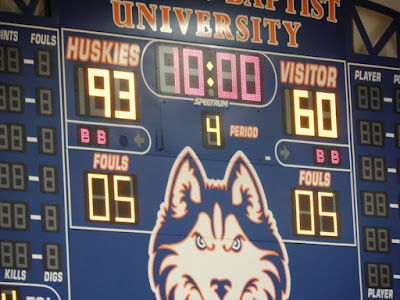 HOUSTON, TEXAS (November 10, 2018) The HBU Huskies men's basketball team kicks off their 2018-19 home schedule with a 7 p.m. CST game against the Fordham Rams on Saturday evening. The Huskies will be looking for their first win of the season, after dropping a 90-60 decision against Arizona at the McKale Center in Tucson on Wednesday night. Junior guard Jalon Gates (Clemens HS, Sugar Land, TX) led the way for the Huskies with 15 points against Arizona, followed by Oliver Lynch-Daniels (Oak Hill Academy, Chapel Hill, NC) with 10. Head coach Ron Cottrell, in his 27th season of leading the Huskies, returns nine players from a 5-25 season in 2017-18; in which they failed to qualify for the Southland Conference Tournament. With an influx of three transfer players and three high school recruits, The Huskies will be working towards returning to the conference tournament and the NCAA playoffs. Fordham won its opener at home against City College of New York by a score of 106-58. The Rams finished the 2017-18 season with a 9-22 record and posted a single win (1-10 record) on the road. Saturday’s game marks the first ever meeting between the two programs and is the Huskies’ first game against an Atlantic 10 opponent since the 2011-12 season when HBU visited Duquesne. The game can be heard on the DNA Husky Sports Network broadcast with Chase Hernandez, available at HBUHuskies.com.